A. BP who drilled and completed a nightmare well with unsafe techniques? B. BP and Transocean who owned and operated the rig? C. BP and Transocean and Cameron who made the blow-out preventer which failed? A report from the Center for Public Integrity suggests that the ultimate responsibility for the BP oil leak disaster lays with the Obama administration, mainly because of a botched response to the initial fire from the Coast Guard. "The Coast Guard has gathered evidence it failed to follow its own firefighting policy during the Deepwater Horizon disaster and is investigating whether the chaotic spraying of tons of salt water by private boats contributed to sinking the ill-fated oil rig, according to interviews and documents. "Coast Guard officials told the Center for Public Integrity that the service does not have the expertise to fight an oil rig fire and that its response to the April 20 explosion may have broken the service's own rules by failing to ensure a firefighting expert supervised the half-dozen private boats that answered the Deepwater Horizon's distress call to fight the blaze. "An official maritime investigation led by Coast Guard Capt. Hung M. Nguyen in New Orleans is examining whether the salt water that was sprayed across the burning platform overran the ballast system that kept the rig upright, changing its weight distribution, and causing it to list." 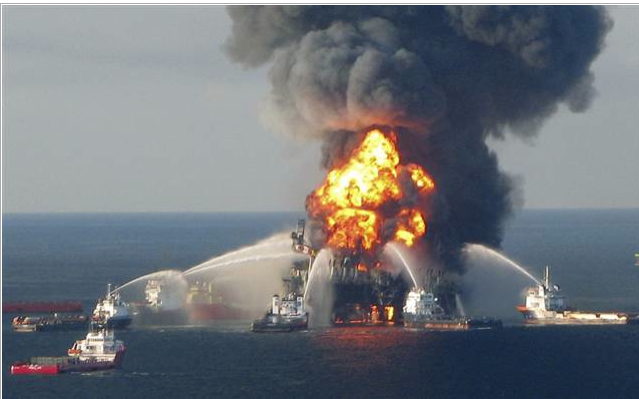 Oil platform fires are generally fought using foam, which is a more effective fire suppressant. While the Coast Guard does not itself fight these kinds of fires, it is charged with coordinating fire-fighting activities at off-shore facilities like oil platforms. The use of salt water rather than foam evidently led to the collapse of the oil platform. This is very important, because the oil leak did not occur until this happened. "While investigators have zeroed in on a series of missteps and ignored safety warnings aboard the rig that preceded the fiery explosion April 20, the question of what caused the platform to collapse into the Gulf two days later remains unanswered and could prove vital to ongoing legal proceedings and congressional investigations. "That is because the riser pipe from which the majority of BP's oil spewed did not start leaking until after the rig sank. Experts and some lawsuits have openly tied the sinking of the drilling vessel to the severity of the leak. " "The crippling budget cuts President Obama proposed for the Coast Guard also deserve a closer examination. Obama's spending plan reduced the blue water fleet by a full one-third, slashed 1,000 personnel, five cutters, and several aircraft, including helicopters. According to the Center for Public Integrity, the Coast Guard updated its official maritime rescue manual -- advising against firefighting aboard a rig -- just seven months before the Deepwater Horizon explosion. That change in policy came at a time when Adm. Thad Allen warned the budget cuts threatened to turn the Coast Guard into a 'hollow force.'" It's just a larger, lovelier, portable version of the trackpad on Macbook Pros. Let me re-phrase that - it's just a larger, lovelier, portable version of the trackpad on Macbook Pros that will up the productivity of a billion people. I've used a Magic Trackpad at my desktop for a couple of days now. The killer gesture is the drag. Yes, it drags windows around, which is handy, but it moves anything around, such as image boundaries in 'crop' mode, and window corners to re-size the window, files or other objects from hither to thither. Oh, oh, oh! I've just discovered the 3-finger backward-forward gesture. My life will never be the same.